A neglectful husband; a past riddled with missed opportunities and searing regrets; a sharp, inquisitive mind rendered stagnant by domesticity; a family who takes her for granted; being named Agnes: the logarithm of suffering checks all the request boxes in Marc Turtletaub’s Puzzle. It’s a film of modest ambitions, made by a director whose history as a producer includes the likes of Little Miss Sunshine, Sunshine Cleaning, and Jack Goes Boating. Which, as a review, may as well speak for itself. Depending on my temperament, I can describe the qualities of the Turtletaub genre of films as either toothless renditions of white domesticity or modest (there’s that word again, which practically reads as a polite version of lame) examinations of white anhedonia. Neither of these definitions are especially generous but I won’t deny that these films can provide a measure of solace and comfort, especially when they’re anchored by some especially terrific performances. Little Miss Sunshine had Steve Carell and Alan Arkin, Sunshine Cleaning had Amy Adams and Emily Blunt, Jack Goes Boating with Philip Seymour Hoffman. Puzzle has Kelly McDonald and as you’d expect, she’s astonishingly good. Shame that the movie she supports is so pedestrian. The film centers on Agnes (Kelly McDonald). It’s her birthday and she’s perusing through her presents. While unimpressed with the new iPhone she receives from her two sons, it’s a thousand-piece puzzle from a relative that captures her attention. She solves the puzzle in an afternoon, though neglects her quote unquote wifely duties, and is met with bewildered antagonism from her meathead husband Louie (David Denman) and their two sons. 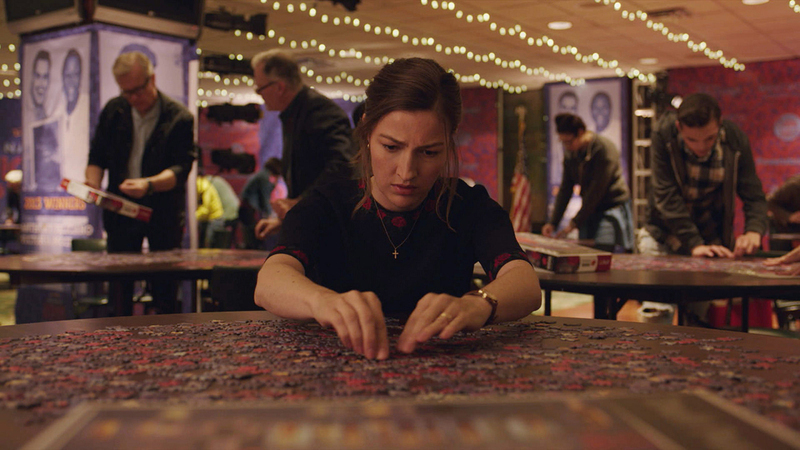 But Agnes’ interest in puzzles takes her to a novelty puzzle store in New York City, where she encounters a sign requesting a puzzle partner. She follows up on the ad, meeting with Robert (Irrfan Kahn), and strikes up an immediate though cautious friendship. The two are lonely figures, overwhelmed by the pity they feel for one another, as they each attempt to shake their limbs from the icy coolness of their solitude. Puzzle goes exactly where you expect it to, with Turtletaub utilizing numerous hackneyed devices to elevate his puzzle motif into something a little more distinguished and literary. It doesn’t really work, mostly because so much of the film’s dialogue (written by Oren Moverman and Polly Mann) boils down to vapid pontifications on emotional hollowness and loneliness. It’s a lot of surfaces without actually examining the depths of these characters. Moments where Agnes finds herself surprised by the cost for a train ride or a phone call she makes to Robert are touching because they add a dimension to her character that implies her isolation and need for attention without outwardly expressing it. The latter is also one of the few visually memorable moments of the film, a close-up shot of McDonald lying on the grass, her face and the verdant backdrop tearing through the autumnal sunlit hues that imply despair. And it’s a moment like that might indicate that something more profound is at play in Puzzle. But these scenes are really just aberrations in a film content with coasting on blasé lip service to genuine despair and loneliness. McDonald gets it. Kahn does too. But everyone else orbiting this production are just limning, attempting to flatter you with hollow recognition. Thing is, you can see through it, just like you can spot a single missing piece in a jigsaw. It’s obvious.